I liked the pieces in Chicago painter Vidvuds Zviedris’ exhibition at McCormick Gallery almost instantly. 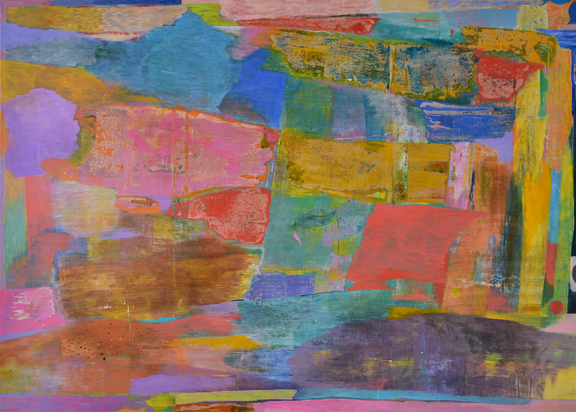 The pink and yellow plains, scoured surfaces and scattered décollage in a work such as “Symphony of Ghosts” feels almost medieval, like aging frescoes in a forgotten monastery. The plaintive deep blues of “White Foxes” even manage to recall Giotto in an exhibition dominated by the sunny optimism of Matisse. But, over the years I’ve grown suspicious of work that goes down too easily. For all their charms, Zviedris’ luminous pictures read fast, and after the tasteful balance of high-key color and shallow pictorial space runs their course, there isn’t much left to savor. The shrewdly incorporated passages of newsprint, torn and transferred to the paintings’ surfaces via acrylic medium, mitigate the works’ rapid consumption, but they don’t contribute any significance. The ultimate effect is merely another formal device; beautiful, but meaningless. As visitors to this year’s EXPO likely saw, contemporary abstract painting is in real trouble. With the mantle of serious ambition and social relevance being monopolized by bland photographers and overrated conceptualists, it is abstract painters, mired in a self-gratifying morass, that seem content churning out can’t-fail stripe and dot paintings that rate little higher than pricey versions of art-light for sale at your nearest Target. In just over fifty years, abstraction has gone from the chief weapon in an all-out assault on bourgeois attitudes to the default choice of bankers keen on filling that space above their couch. Through December 7 at McCormick Gallery, 835 West Washington.